AROUND THE BLOCK – Manas Toews hits the ball around the block during the 2019 Pepsi Volleyball Yukon Indoor Championships at Porter Creek Secondary School on Saturday. 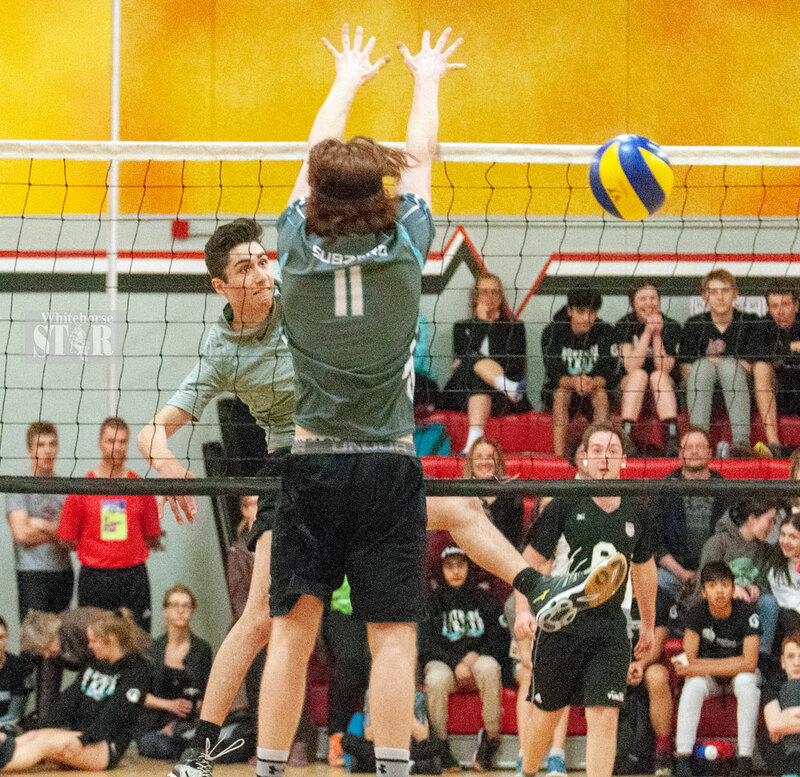 The gym at Porter Creek Secondary School was divided into three courts for the 2019 Pepsi Volleyball Yukon Indoor Championships and the volleyball action did not stop until the champions were named on Saturday. The tournament offered the Yukon teams an opportunity to prepare for their upcoming trips to Provincials and Nationals. As well, it provided athletes, coaches, officials and volunteer development in line with growing volleyball. Melissa Laluk, the coach of the U16 team, said the tournament gave the players a chance to get some competitive game experience before they leave for their tournaments. "For some of these guys, they haven't had the chance to compete, some of them have," said Laluk. "So it's really their first chance for competition before they go off to Provincials and Nationals. "So it is kind of working the little kinks that you got to work out before you go. It was good in that way and I think overall everyone had a good time." Laluk's team will be competing in the B.C. Provincials in May. She said the tournament enabled her to identify what the team needs to work on in the weeks leading up. "We've got a few weeks, so we have a few things to correct beforehand," said Laluk. "The group I have is strong; they just need to know they are strong. We have honed in on the target for the next three weeks." Laluk said the tournament was blended, and it was something different for the teams. Gary Seeley, coach of the 17U girls team said the blended format lead to a great weekend for all the teams. "It's a great warmup for all the Yukon teams to get out and get ready to go down south and go over the rules and what need to do as teams and what we need to work on before we go down," said Seeley. "Playing some teams that are older than us to provide us competition and then providing that competition to teams that are younger than us to mentorship. It's a great weekend for all the teams." Seeley's team will be travelling on Easter weekend to their tournament. He said the tournament gave him ideas on what to focus on in practice before leaving. "As coaches we probably good four, five points out of the weekend of things we need to work on," said Seeley. "Maybe new things we want to add to our offence and just overall team defence and team offence, stuff that we need to work on as a whole." Seeley said the team will be ready for their B.C. Provincial matches. "This team is geared up," said Seeley. "Going down to that early tournament like we did early in the season and playing some of the local teams when we get a chance and this weekend here we will get a couple more matches out of some local teams before we go down. Now were are starting to warm up before we head down to B.C. Provincials." The gym at Porter Creek on Saturday was loud. The players' voices rang through the air as they called for the ball or celebrated a won point. The high-pitched screech from the referee’s whistle cut through all the other noise. At the end of the final game Saturday, referee Michael Hanson put his whistle away for good as his retirement was announced. Hanson has been officiating volleyball in the Yukon for more than 30 years. In his years as a ref, Hanson watched the game grow in the territory. "Volleyball has evolved a lot," he said. "I mean, the club part has just grown exponentially and the coaches, there is a really strong core of coaches sticking with it. Parents are the other one. There is a really good camaraderie in volleyball and the numbers have grown." Hanson said it was always exciting to watch the players progression as they went from three ball and moved their way up. In the fall Hanson will be moving from the Yukon to Alberta. For volleyball to continue to grow in the territory, he said, they need to stay on the same course. "I think it needs more of the same, keep going," said Hanson. "They are still climbing and growing. The quality of what you see now at kids of a young age the volleyball is better. When they get to senior, they are quite competitive. "They are sticking with it down south. They are sometimes bringing back medals and doing better than they thought they were going to do. That is all the coaches and parents." When Hanson started, he said the level of play was not as strong, nor did they have the numbers. He credits the splitting of the high schools in making volleyball more competitive. "That made a huge difference," said Hanson. "When it was only F.H., it was a core group that would go to Arctics, Abbotsford for Nationals. Now, because of the different high schools and Dawson, who put on the best tournament every year, you see that grow. That kind of movement in volleyball is wonderful." The Subzero Blue team won the 14-15U boys championship. Subzero #2 took the 16-17U honours. The Subzero Peak was the 17U girls champs and the Subzero Sharks won on the boys' side. The Heat Yukon Coed won the adult open title.